A leader in residential and commercial renovations, Sky Creation is pleased to have been selected by HomeRenoGuru as a partner in the first of its exclusive monthly special packages. In particular, Sky Creation is extending an exclusive offer on its popular Standard and Premium packages for HDB apartments. Honoured with a string of industry awards, this growing enterprise has offshore offices in leading cities in the region and enjoys a reputation for great quality, impeccable service and excellent value. Sky Creation benefits its clients greatly by owning and operating its own fully equipped workshop, together with close working relationships with premium kitchen brands. It insists on quality materials, as exemplified by the ‘Anti Stain’ super polished homogeneous floor tiles that come with its Standard package. Unlike many other firms that source for cheap unbranded materials, Sky Creation insists on high quality materials that will outlast the warranty and reaffirm your choice of interior design firm for many years to come. Sky Creation’s Standard and Premium packages come with all the usual inclusions together with a casement built-in wardrobe in the master bedroom and a tempered glass shower screen in the master bathroom. The Standard package uses only market-leading Nippon Paint in all painting works. 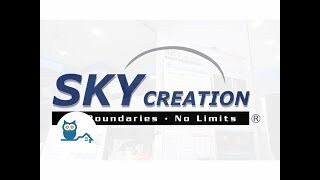 Though many firms offer a turnkey solution, Sky Creation truly delivers. Clients enjoy a single point of contact from conception to completion of a project, and can confidently expect the keys to their renovated home delivered to them on time and on budget.